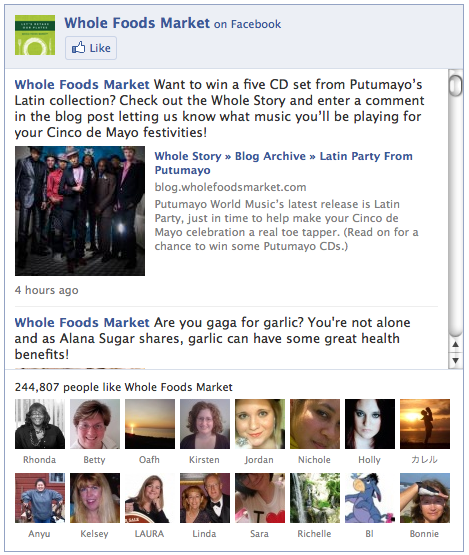 Whole Foods Market Facebook Like Box. Create an attractive landing tab (canvas page) with a video that explains exactly a) what your fan page is about, b) who it’s for and c) why they should become members. The result: you’ll increase your conversion rate from visitors to fans. 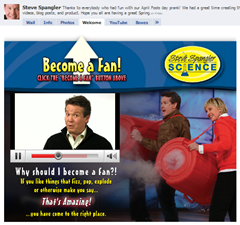 One ofmy favorite fan page welcome videos is by Steve Spangler, the Science Guy! After watching his video, you can’t help but want to join! I recently tested a new live video-streaming app called Vpype. The app adds a tab to your fan page called “Shows” and when you broadcast as your fan page, everyone can view by default. (You can also broadcast as your personal profile and selectively invite friends/friend lists). I wrote up a review of this app here. By announcing via Twitter, your personal Facebook profile, your blog and your email list,you can broadcast regular live Internet TV shows from your fan page and create much buzz. If you host live events, be sure to take plenty of photos (or even hire a professional photographer), load the photos to your fan page and encourage fans to tag themselves. This, again, pushes out into their wall and friends’ News Feeds, providing valuable (free!) exposure. And, a picture says a thousand words – we notice the thumbnails in our feed more than text. Even with a nominal weekly/monthly budget, you should be able to boost your fan count using Facebook’s own social ad feature. It’s the most targeted traffic your money can buy. To buy an ad, scroll to the foot of any page inside Facebook and click the link at the very bottom that says “Advertising.” From there, you can walk through the wizard and get an excellent sense of how many Facebook users are in your exacttarget market. This is somewhat of a gray area because Facebook changed theirPromotional Guidelines last year. Essentially, you need prior written permission from Facebook and need to be spending a significant amount on ads per month. However, you CAN require Facebook users to become a fan of your fan page in order to enter a contest, sweepstakes, drawing or competition. See these two postsfor further explanation. PLUS, good news: you CAN run contests and sweepstakes with the use of the apps created by Wildfire App. 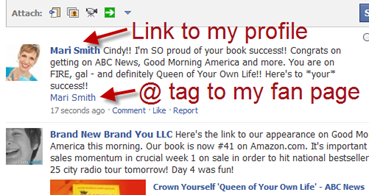 Link your Twitter account to your Facebook fan page and automatically post your Facebook content to Twitter. You can edit what gets posted, choosing from Status Updates, Photos, Links, Notes and Events. You have 420 characters on the Facebook publisher and 140 on Twitter. In the tweet that goes out, Facebook truncates your post past a certain character count and inserts a bit.ly link back to your fan page. To track click-through stats on that link, just paste the bit.ly link that Facebook created for you in your browser’s address bar and add a “+” sign to the end. This works for any bit.ly link! I also recommend you promote your Facebook fan page on your Twitter background and possibly in your Twitter bio/URL field too. Your fans can join your fan page via text message! You’ll need to get your first 25 fans and secure your username. Then, to join your fan page, Facebook users just send a text message to 32665 (FBOOK) with the words “fan yourusername” OR “like yourusername” (without the quotes). Look at every piece of print media you use in your business. 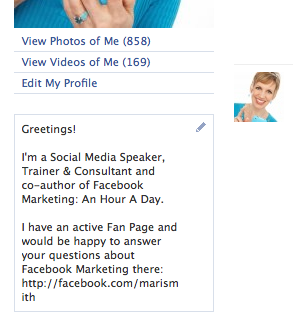 Your Facebook fan page (as well as Twitter and any other social sites you’re active on), should be clearly displayed. Put your Facebook fan page link (and the logo) on your business cards, letterhead, brochure, print newsletter, magazine ads, products, etc. If your business is run from physical premises, put a placard on the front deskletting your customers know you’re on Facebook. Ideally, you have a simple, memorable username. Incentivize customers to join right away via their mobile device and show you/your staff the confirmation for some kind of instant reward! You might give out physical coupons promoting your fan page. For restaurants, put the Facebook logo, your username and a call to action on your menus. I was at a hotel in San Francisco last fall and they had a placard in the elevators promoting their presence on Facebook and Twitter. The sign was very noticeable because of those ubiquitous Facebook and Twitter logos/colors! Be sure to format the URL with http:// otherwise it will not be clickable with just the www’s. You have a limited amount of characters, so keep it succinct and leave out the www’s. You can put in hard line breaks though to make the content easier to read. The Share button is all over Facebook and is a very handy feature. It only works for sharing on your personal profile. 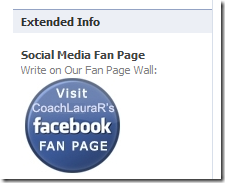 So periodically go to your fan page, scroll toward the bottom left column and click the “Share+” button. Add a compelling comment along the lines of exciting news, recent changes, special incentives, etc., happening on your fan page and invite your friends to join if they haven’t already. 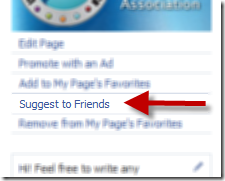 I find the Share button far more effective than the Suggest to Friends approach. (And, if you’d like to Share content from the web on to your fan page vs. profile, I highly recommend using theHootlet bookmarklet tool at HootSuite.com). As long as you’re a fan of your own fan page, you can “@ tag” it on your own personal profile wall. From time to time, you can let your friends know about something happening on your fan page by writing a personal status update that includes tagging your fan page with an @ tag. Simply start typing the “@” symbol and the first few letters of your fan page name (this works whether you have your user name registered or not), and it will appear from a drop-down menu to select. 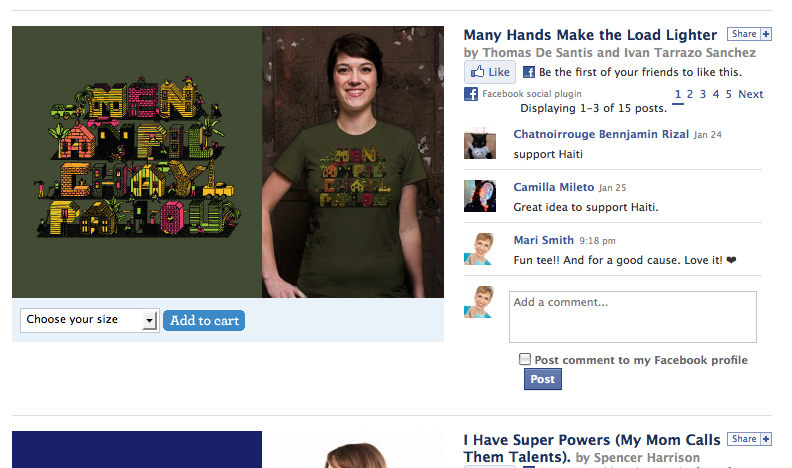 This then makes it a nice, subtle hyperlink that your friends can choose to click on. A subtle way to gain more visibility for your fan page is to add an @ tag for your fan page when writing on your friends’ walls as a way to sign off. I would use this one sparingly and, again, monitor the response from your friends. I have never been a fan of adding a signature block on Facebook wall posts because our name and profile picture thumbnail are always hyperlinked right back to our profile anyway. But the simple @ tag could be effective. As with adding your fan page @ tag to posts you make on your friends’ walls, you could equally use the same technique when posting on other fan pages. This needs to be used with discretion and I would advise against doing this on any potentially competing fan page! I won’t rule this one out completely as it does depend on how many friends you have, your relationship with your friends, how often you suggest fan pages/friends to your friends, etc (see ‘The Big Myth’ above). But I do recommend monitoring the response to this technique – perhaps simply by asking for feedback in your status update. 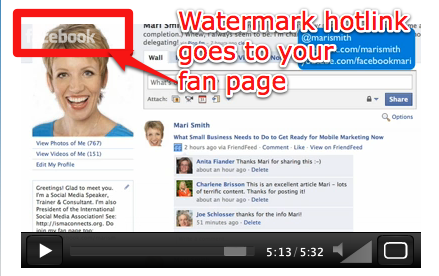 So, these are just 21 ways to create strategic visibility and promote your Facebook fan page.